Our latest effort to dispel the mysteries of the modern visual landscape takes us back onto the great American road. For previous columns, click here; to submit your own suggestions, email us. Do you like driving on highways crowded with big trucks? I’m guessing not. Maybe you’ve seen Steven Spielberg’s Duel (tagline: “Fear is the Driving Force”) or Stephen King’s Maximum Overdrive (“Evil’s Wheels”) one too many times. Whatever the reason, just know that the feeling is mutual. Lately, trucks have been undergoing their own transformation. 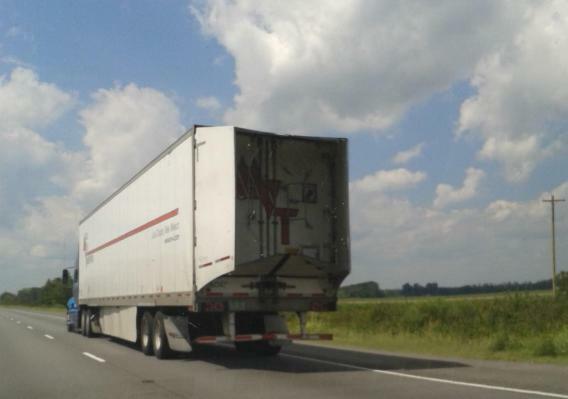 On a recent drive on I-40 between Memphis and Little Rock, Nathan Hamilton, a resident of North Little Rock (and a Slate reader), saw a truck with some funky panels on the side and back, and sent What’s That Thing an email. What are these panels called, and what’s their purpose? The panels under the body of the truck are called aerodynamic panel skirts, side panels, or side skirts. The panels that hang off the back are often called rear tail fairings, trailer tails, or sometimes boat tails. Whatever you call them, their purpose is to reduce drag and save fuel. According to Susan King, a spokesperson for the American Trucking Associations, side panels “reduce drag on the undercarriage and wheels of the rig, thereby improving fuel efficiency,” while tail fairings reduce drag around the rear of the vehicle. How much fuel do they save? Between 5 percent and 15 percent, with 10 the average, according to King. How do you unload the truck? You fold the panels out of the way. So were these panels invented in response to rising fuel prices and growing environmental concerns? Yes—but not recently. Numerous patents, starting in 1935 for rail cars, attest to decades of ongoing efforts to streamline vehicles. Crystal Arvigo, a spokeswoman for ATDynamics, says that side skirts started to become more common in the U.S. between 2003 and 2005, but really took off in 2008. How green, exactly, are side skirts and tail fairings? Crystal Arvigo told me that tail fairings on a long-haul trailer that does 60,000 miles per year can save 480 gallons of diesel fuel, which equates to 10,752 lbs, or 4.9 metric tons, of CO2 that is not emitted. According to the EPA, the average car emits about 5.1 metric tons of CO2 per year. So each time a long-haul trucker installs tail fairings, that’s the rough global-warming equivalent of taking a car off the road. If side skirts and tail fairings are so great, why doesn’t every long-haul truck have them? Price is one reason. 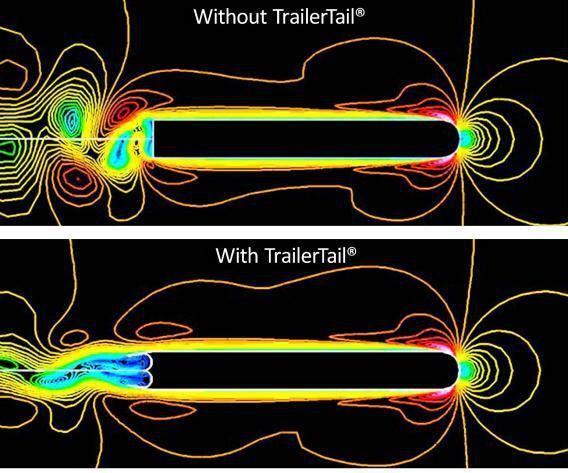 A set of TrailerTails costs around $2,200, according to Arvigo, though volume discounts are available to fleets. Uncertainty about fuel prices is another. Long-term investments in fuel efficiency—especially those undertaken by small businesses, like owner-operators—make a lot more sense when high fuel prices are a long-term certainty. That fundamental truth of energy policy has long been obvious to many economists and environmentalists (if not, it seems, to politicians). Have a favorite trucking movie, aside from the top ten listed here? Add it to the comments. And if you’ve wondered about something, on or off the great American road, send it with a pic to whatisthat@markvr.com.